Go to your WordPress dashboard > Settings > General. Site Title - The name of your website. If you are not using a header/logo image on your site, this is what will display as your header. This is also what is shown as your site title in Google search results. Site Tagline - The tagline of your site, typically used as a short descriptor for what your site is about. WordPress Address (URL) - The URL of the WordPress directory where your core files are located (do not change). Site Address (URL) - The URL of your website (do not change). Email Address - Enter your email address here to receive notifications and allow you to reset your password. 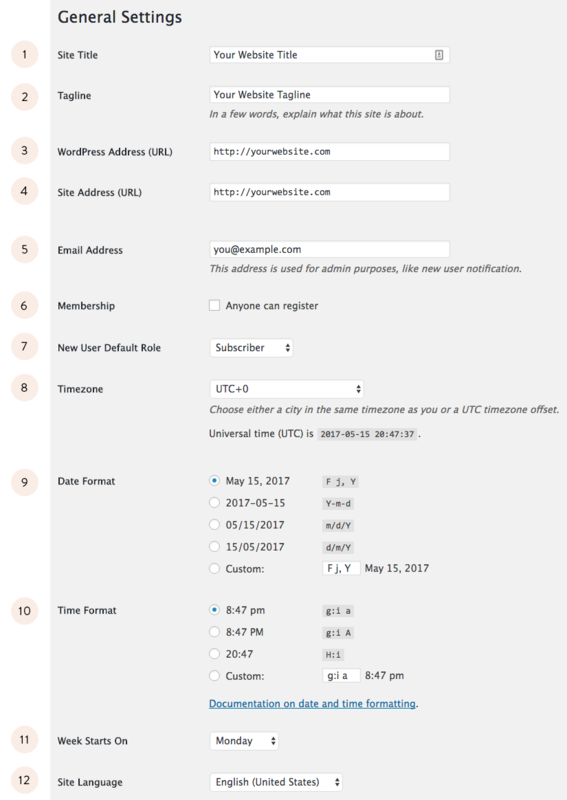 Membership - If you check this box, anyone can register an account on your site. Check this if you are selling e-commerce products or run a membership site. New User Default Role - The default role that is set when a new member is registered or created. Timezone - Sets local timezone for your site. Date Format - Changes how the date is displayed on your website. Time Format - Changes how the time is displayed on your website. Week Starts On - Select the weekday on which you want the WordPress calendar to start. The default is Monday. Site Language - Sets the language in your WordPress dashboard.